A DUP representative has branded the planning behind the new Seamus Heaney Centre, due to open next weekend, as ‘rushed’ after the council was forced to make last minute changes to the car park. 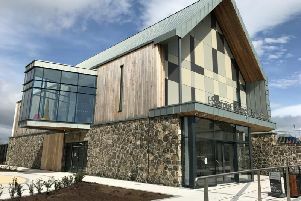 Councillor Clement Cuthbertson criticised the speed at which the £4million project was pushed through the planning process after questioning where the extra money came from at Mid Ulster Council’s monthly meeting. The council was forced to find an extra £24,573 in a matter of days to fund the necessary improvements to the HomePlace car park, according to the councillor. This is on top of an extra £250,000 needed for alterations to the centre’s performance space and cafe. “It appears that the council can rustle up funds to make these last minute changes, but when it comes to supporting other community projects such as the astroturf pitches in Cookstown, Dungannon and Aughnacloy, it is suddenly cash-strapped”, he said. “I raised safety concerns about the car park at the very start, and the fact that visitors will have to walk along a road to get to the centre. The Heaney family will open the centre at a special event on September 29 in the presence of 200 guests.